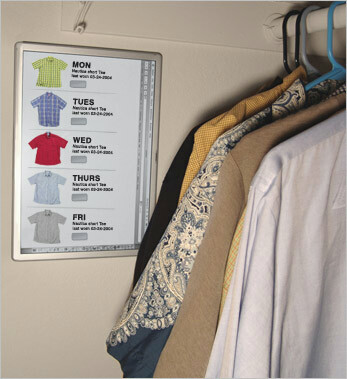 First came the Weather Clock, the Digi-cube, and Dogger, now we proudly unveil Wardrobe Manager: a WiMax-enabled wall-mountable display that uses the RFID tags embedded in clothing to maintain digital inventory and usage patterns and recommendations for your wardrobe. Wardrobe Manager uses its always-on Web connection to retrieve product information about each of the RFID tagged items in your closet including: product photos, warrantees, care instructions, purchase dates, cost, and more. You may also set Wardrobe Manager to track your daily clothing selections. The interface can then make suggestions based on what you wore in the past, what remains in your closet, what could potentially match your current selection, what a trusted friend has suggested (through a shared social network), and what is most appropriate given today’s weather forecast. Never wear the same shirt to work twice in one week again!